Poker1.com is owned, managed, and designed by Mike Caro. Click to learn how it works. 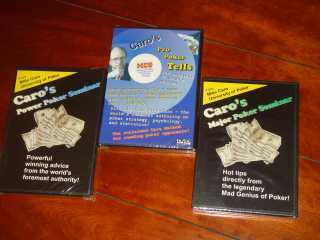 DVD included: ✓ Caro’s Pro Poker Tells. In 90 electric minutes, Mike Caro will show you the world’s most profitable poker tells in motion! See for yourself when opponents are bluffing, when they aren’t, and learn why. Based on his classic poker tells book, Caro uses real poker players, cards, chips, and tables. He demonstrates once and for all how you can extract free money from opponents who are unknowingly telling you what cards they hold. Finally, this amazing video makes the science of poker body language easy to understand. DVD included: ✓ Caro’s Power Poker Seminar. This was the first time that Mike Caro allowed one of his high-energy, pure-profit seminars to be filmed. You get it all in one dramatic hour of winning tips, tactics, and long-guarded secrets. Betting, raising, tells, bankroll, bluffing, motivation, and much more. You’ll discover why Mike Caro’s magic seminars have revolutionized poker by providing the most privileged and profitable advice in a dynamic and entertaining way. DVD included: ✓ Caro’s Major Poker Seminar. Attend one of Mike Caro’s intense, easy learning poker seminars in your own home. This video will stand by itself or can be studied as a companion to Caro’s Power Poker Seminar DVD. Some of the “Power Poker” video’s advice is underscored in this “Major Poker” version by being presented differently at another location. This is real, unscripted poker education covering betting, raising, bluffing, tells, manipulation, motivation, and much more. In exclusive additional footage, Caro teaches and enhances key points after presenting them live. Caro on Gambling: This rare, out-of-print book helped ignite the modern gambling revival by eloquently focusing on revolutionary concepts and analysis. A pleasure to read and easy to understand, this is Mike Caro at his best, telling you which forms of gambling you can beat and which you can’t. Of the 23 thought-provoking chapters, eight are dedicated to poker. A small quantity was recently discovered in storage. Not available anywhere else. A true collector’s book. Caro’s Fundamental Secrets of Poker (special edition): Another rare, out-of-print book that you’re not likely to find. This special collectible edition of Caro’s acclaimed book was printed for promotional distribution at the Trump Taj Mahal (Atlantic City) in 1993. A hard-to-find collector’s book. on your credit card and billing statements. Poker1.com content © 1960 - 2017 Mike Caro. All rights reserved worldwide.